Upma: Upma or Uppuma or Uppittu is a common South Indian and Kannada breakfast dish, cooked as a thick porridge from dry roasted semolina. Various seasonings and/or vegetables are often added during the cooking, depending on individual preferences. Upma is usually served with coconut chutney, lime slices or lime pickle. Upma is nutritious, tasty and very easy to make at home by mixing and cooking roasted rava (semolina) in water. Heat the oil in a non stick frying pan, on medium heat. Fry till the cashews start to turn golden. Add in the chopped green chilly, chopped ginger and curry leaves. Add the water to this mixture and let it come to a boil. When the water comes to a rolling boil, lower the flame and add the roasted semolina to it. Keep on stirring while you drizzle the semolina. Note: If you add the semolina all at once, lumps will be formed. Keep stirring so that the upma does not stick to the pan. Upma is ready to be served. Serve upma hot, with slices of lime or coconut chutney or lime pickle. 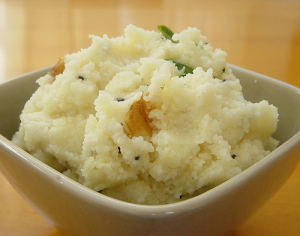 If you have any queries regarding the Upma recipe, please leave a comment.